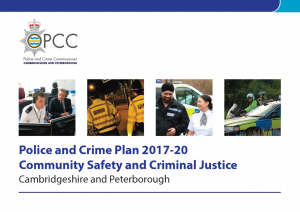 One of the roles of the Police and Crime Commissioner is to produce a Police and Crime Plan for the county. The plan sets out the police and crime objectives for the county. Click on the image to the right for the latest Plan. The Plan also sets out financial and other resources will be allocated – including setting the precept and issuing crime and disorder reduction grants. 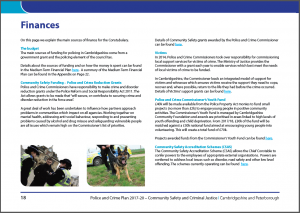 The Commissioner can issue grants to any organisation which they consider will contribute to securing crime and disorder reduction in an area. Details of the finances and how they are allocated can be found in the Police and Crime Plan Budget section.